My sister ordered wedding cards from me, one of them for my cousin’s wedding this last Saturday. So I decided to show off the beauty of the First Frost Bundle and the Frosted Florals Suite of Products. The Designer Series Paper is GORGEOUS and full of shimmery goodness. I highly recommend this suite to everyone, it is a must-have in my craft room. With a Stampin’ Trimmer, cut a piece of Shimmery White Cardstock to 4 1/4″ x 11″. Score and fold at 5 1/2″. Cut a piece of Galvanized Metallic Paper to 4 1/8″ x 5 3/8″. Adhere with Stampin’ Dimensionals. Tip: Cut out the center leaving a 1/2″ border, creating a frame, to save paper (since it will be covered up). Cut a piece of Shimmery White Cardstock to 4″ x 5 1/4″. 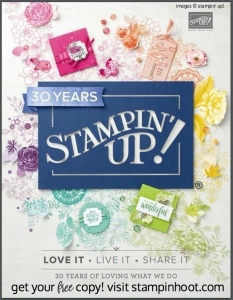 Adhere with Stampin’ Dimensionals. Using the Big Shot and the sprigs die cut, crop out three Galvanized Metallic Paper Sprigs. Stamp the long floral image in Night of Navy onto Shimmery White Cardstock. Crop with the Big Shot and coordinating framelit die. Snip in half with a Paper Snips. Cut a piece of Night of Navy Cardstock to 2″ x 4″. Cut a piece of Frosted Floral Designer Series Paper to 1 3/8″ x 4″. Adhere together with Stampin’ Dimensionals. Add Snail Adhesive to the backside, adhere the long floral image and metallic sprigs as shown. Adhere to the card base with Stampin’ Dimensionals. Using the Stitched Label Framelit (from the Stitched Label Framelits Dies) and the Big Shot, crop a piece of Night of Navy Cardstock. Stamp the two sentiments as shown in Versamark Ink, cover with White Stampin’ Emboss Powder, remove the excess and set with a Heat Tool. Adhere with Stampin’ Dimensionals. Stamp 3 small flowers and 2 large flowers in Night of Navy Ink onto Shimmery White Cardstock. Crop with the coordinating framelits dies. Adhere as shown with Stampin’ Dimensionals. Add three Silver Metallic Pearls for a final touch. The Galvanized Metallic Paper pairs perfectly with the Frosted Floral Designer Series Paper. Combining the shimmer of both products really makes your jaw drop. I almost wanted to keep this card for myself. Do you subscribe to my newsletter? Every month, my newsletter subscribers receive a Bundle of the Month Special Offer. This month just happens to be the Frosted Floral Suite of Products used to create this card. You can see the details of the special offer below. Click to Order the Frosted Floral Suite of the Month!